Viennese cellist, composer, and conductor Richard von Perger (1854-1911) began his musical career relatively late, studying cello and composition with Schmidtler and Zellner beginning in 1870. 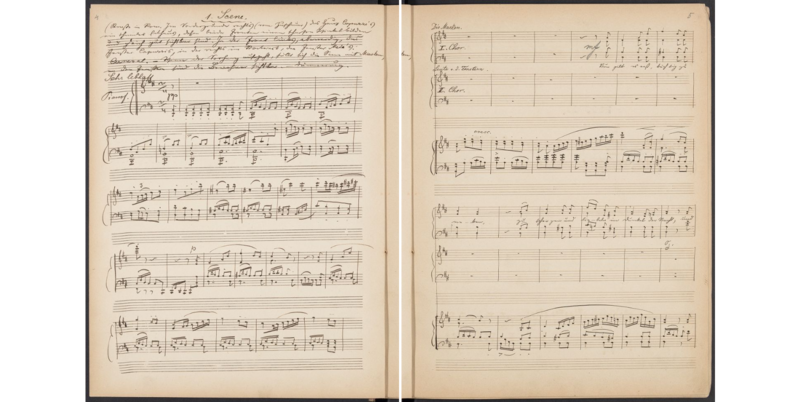 This unpublished early opera dates to 1879, shortly before he began lessons with Johannes Brahms (although Peter Clive suggests in Brahms and His World: A Biographical Dictionary that Perger’s study with Brahms may be apocryphal). A comic opera in three acts, based on E. T. A. Hoffmann’s novella, Signor Formica tells the story of the 17th-century Neapolitan painter Salvator Rosa’s adventures in Rome, and the series of tricks he plays – with the help of an acting troupe led by Signor Formica – in order to fix up his friend Antonio with Marianna, in defiance of her uncle Pasquale Capuzzi, an aesthete with delusions of musical talent. The librettist is unknown, although Perger wrote the text for at least two of his other theatrical works, Der Richter von Granada (1889) and Die 14 Nothhelfer (1891). This may be an autograph manuscript; it’s also a relatively clean copy, with only occasional corrections and scratched-out measures, and stage directions indicated throughout. Signor Formica : komische Oper in drei Aufzügen / von Richard von Perger ; Klavierauszug mit Singstimmen. 1879. Much of Perger’s oeuvre remains unpublished, although several chamber works were issued in the late 1800s. He directed the Rotterdam Conservatoire until 1895, when he was selected to succeed Wilhelm Gericke as concert director for Vienna’s Gesellschaft der Musikfreunde. A few years he was appointed director of the Conservatory. In both positions – according to Leon Botstein’s blistering summary of critical responses in Music and its public : habits of listening and the crisis of musical modernism in Vienna, 1870-1914 – his tenure was marked by relatively conservative repertoire, reduced musical standards, financial mismanagement, and public opprobrium, leading to his eventual resignation in 1907.